[00:13:13] <jepler> cradek: fake tach>? [00:51:53] <skunkworks> wow - I think I have a shift component that I can test..
[00:52:12] <skunkworks> rough around the edges - but a good starting point. [00:53:52] <skunkworks> cradek: are they 60v tachs? [00:54:49] <skunkworks> heh - that probably doesn't make sense. [00:55:04] <skunkworks> are they 60v at top rpm? [00:55:42] <skunkworks> Jymmm: thanks :) I think with the right hal component - we could take over the world! [00:56:25] <Jymmm> skunkworks: Jsut keep saying "I think it can! I think it can!" [01:23:22] <cradek> how long did that take me to figure out!? [01:23:41] <skunkworks> heh - try not to think about it to hard..
[01:25:41] <cradek> no, that was my problem in the first place. [01:26:33] <cradek> hey now the knobs work! [01:35:24] <skunkworks> so - are you going to convert all the other axis? [02:35:18] <cradek> skunkworks: you moved your machine!? [02:39:09] <cradek> do you have the amps that you'll use? [12:59:57] <moopy> i am having a stupid newbie problem, i am running the livecd installed and upgraded to compile emc2.2.5.0pre. I run an emc config .ini file and if fails with error "waiting for s.axes"
[13:01:15] <moopy> the config runs fine in the default emc2.3.0 version, anyone know what is happening? [13:02:44] <cradek> changes are required for a 2.3 configuration to work with 2.4 and later. check the UPDATING page on the wiki. [13:51:25] <moopy> OKay i got the updating thing sorted i think, now i have a problem with simulator loading??? [13:54:47] <jepler> if it is different than "./test"
[14:07:46] <CIA-5> EMC: variables using M68. [14:07:50] <CIA-5> EMC: programmed speed and improves operator safety. [14:12:58] <moopy> but would be nice if i knew how to specify the path of a component in 'loadusr'??? [14:15:22] <jepler> and for the removal of doubt, remember that "the current directory" is "the directory containing the inifile"
[14:20:16] <jepler> probably for master only, due to the small risk of breaking an existing configuration which actually names a component "./test.py" for this very reason..
[15:39:26] <moopy> anyone know about linking homing to pyvcp joints? [15:44:13] <moopy> seems if i move joint past 180 degrees then home the axis, then jog in reverse the pyvc dial does not move anymore?? 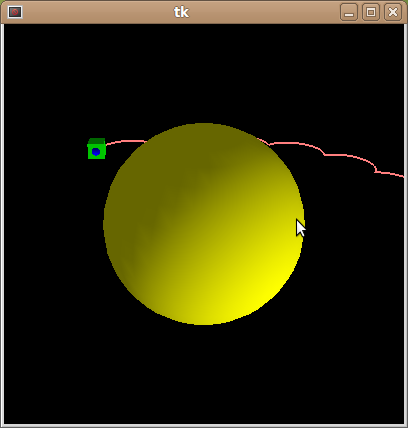 [21:27:11] <moopy> are there any docs on how the 3d drawing functions work and how the puma560gui works? [21:36:32] <alex_joni> moopy: what kind of docs? [21:38:55] <alex_joni> do you mean vismach? [21:40:02] <voxadam> I've been looking at EMC2 for awhile now. I've been focused on planning for the conversion of an old VMC to EMC2 from the current archaic that's on it. While reading up on the EMC's current state I've become quite amazed with HAL. Has any thought ever been given to moving HAL to its own git tree? It seems that HAL could potentially see much wider use that just EMC if it became a project unto itself. [21:46:54] <voxadam> I can understand that. [21:48:02] <voxadam> I've been thinking about using HAL and CL to automate some things that I've been working on in my head. [21:50:12] <moopy> what do the arg represent? [21:50:51] <moopy> move tooltip -1 in z direction? [21:53:04] <moopy> what.... undo it? [21:55:10] <moopy> so if i make another translation its relative to the original coords? [21:56:29] <cradek> moopy: you should play with it! maybe the best way is to modify some of the existing examples and see what they do. [22:01:58] <moopy> what are the last 4 arg in hal rotate.... a x,y,z coord + angle? [22:33:24] <alex_joni> jepler: got a png?